The Qualcomm Snapdragon 675 is an incremental upgrade over the Snapdragon 670. It is a cleverly designed chipset to offer several innovative features in mid-range Android smartphones. 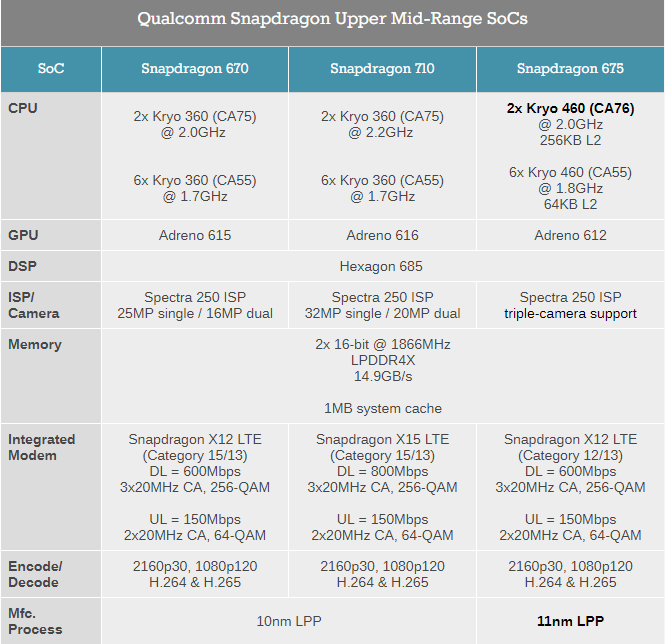 Qualcomm announced an interesting upgrade to its capable mid-range 600 Series processors for smartphones. 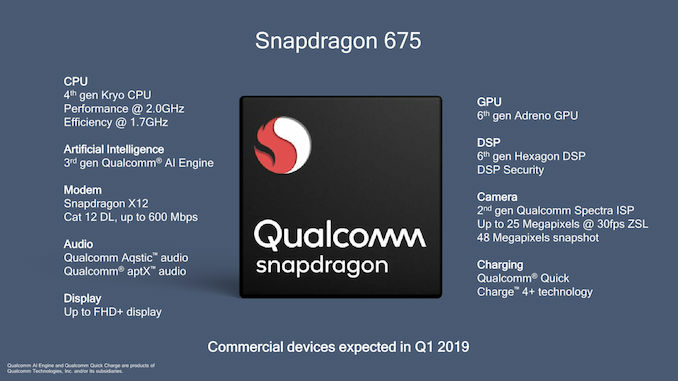 The Qualcomm Snapdragon 675 chipset succeeds the current generation Snapdragon 670. Incidentally, this is the first processor to be manufactured on the 11nm fabrication process. The process isn’t as advanced as the 7nm, but it does highlight continued improvement. One of the highlights of the Snapdragon 675 is its ability to support triple camera setup. This means mid-range Android smartphones sporting the processor, would easily offer advanced imaging capabilities. The Qualcomm Snapdragon 675 chipset is an incremental development over the Snapdragon 670 SoC. Interestingly, the SDM670 itself, is fairly new. 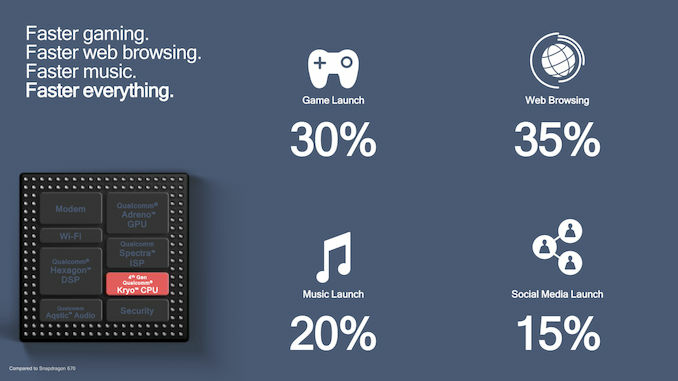 Qualcomm launched the processor in August this year. Interestingly, the Snapdragon appears to be a mid-range processor that sits between the Snapdragon 670 and the Snapdragon 710. Let’s look at what the Qualcomm Snapdragon 675 offers in terms of performance upgrades and efficiency. The Qualcomm Snapdragon 675 System on a Chip or SoC is the first to feature the newest generation “Kryo 460” CPU microarchitecture. In simple words, the chipset’s performance CPUs are based on the new Cortex A76 cores. The SDM675 indicates a change in approach from the chipmaker because this is the first time a new CPU microarchitecture has been first embedded in a mid-range processor, before flagship chipsets. The performance cores are packed in a 2x configuration. They can go up to 2GHz. The performance core array gets 6x Cortex A55 efficiency cores. These cores can go up to 1.8GHz. The Snapdragon 675 offers 15 percent improvement in app launches and 35 percent improvement in web browsing. 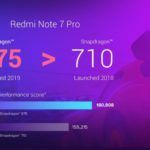 These improvements are despite the fact the Snapdragon 675 is essentially running at the same speed as Snapdragon 670. What’s even more interesting is the fact that the new SoC could outperform the Snapdragon 710 owing to the new generation Cortex A76 cores. 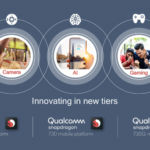 Qualcomm is clearly interested in Android smartphones that are increasingly optimized for mobile gaming. 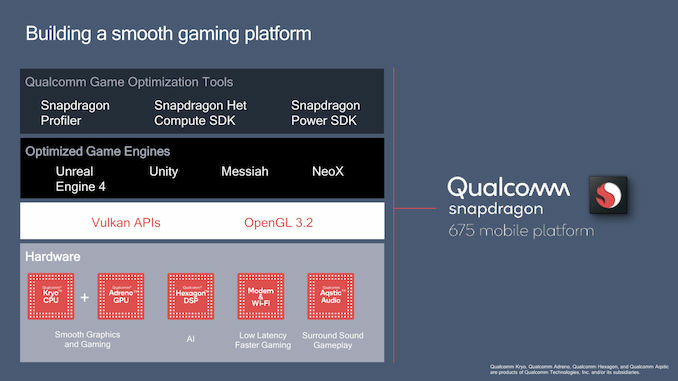 Although the company did not elaborate, it claims the Snapdragon 675 employs some sort of software “gaming enhancements” that promise up to 90 percent fewer “janks”. Needless to mention, the technology appears to compete with Huawei’s GPU Turbo or Oppo’s HyperBoost Acceleration Engine. The other most notable improvement the Qualcomm Snapdragon 675 will bring to mid-range Android smartphones is support for triple-camera setups. 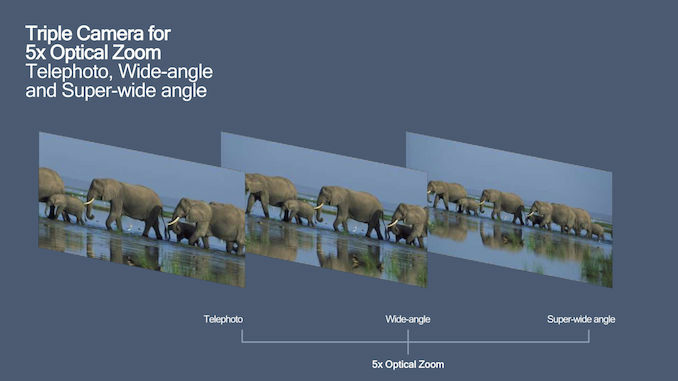 In other words, the processor will allow smartphone users to operate three cameras simultaneously. Needless to mention, embedding multiple cameras within smartphones has become an increasingly common practice. 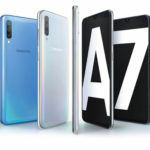 Mid-range Android smartphones like the Galaxy A7, Honor Magic 2, and Oppo R17 Pro, are just some of the devices that already sport triple-camera setup on the back. 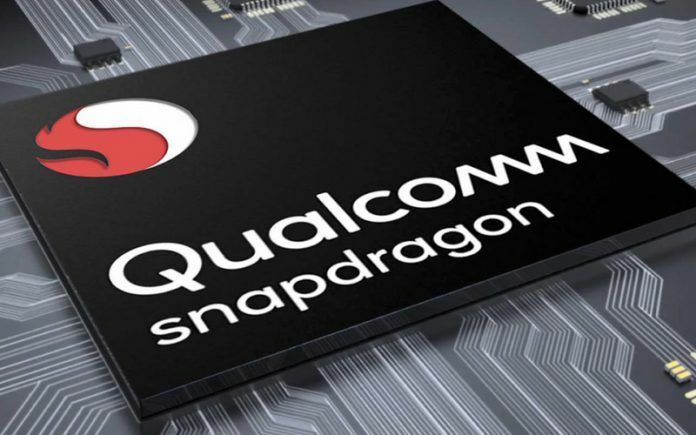 The Snapdragon 675 will allow many more smartphones to offer advanced imaging capabilities with telephoto, wide-angle, and super-wide angle modules. The new SoC enables the hardware and software to support both bokeh (portrait modes) and HDR shots in a single shot. 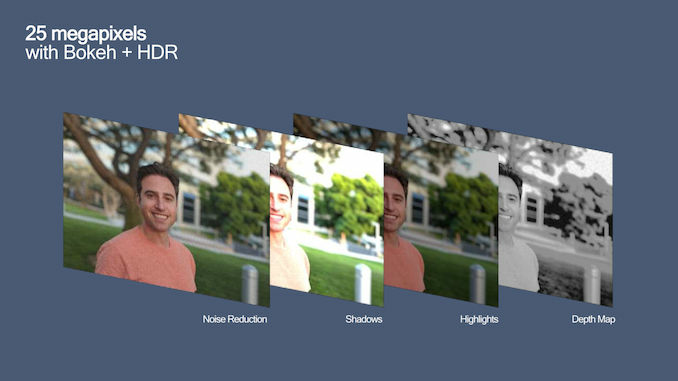 Also, the processor can employ several techniques to gather visual data and seamlessly assimilate the same to offer the final image. The Qualcomm Snapdragon 675 is not a revolutionary new mobile chipset. 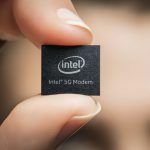 However, it strongly indicates how committed the US-based chip-maker is about deploying capable processors within smartphones. Also, the processor is a step ahead in blurring the gap between budget Android smartphones and expensive mid-range handsets. Essentially, Qualcomm designed the processor as a cost-effective solution while still maintaining performance competitiveness. 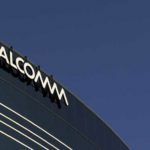 Interestingly, Qualcomm has been silent about the power efficiency aspect. The company stressed about this when it launched the Snapdragon 660 and the 670 chipsets. It is quite likely that pushing battery endurance wasn’t a priority while developing the Qualcomm Snapdragon 675.